Cruiseco, the leading provider of worldwide cruising options in Australia and New Zealand, is delighted to offer travellers a saving of over AUD$2,000* per person on a 17 night fly, cruise and stay holiday package. This unique tour includes return Economy airfares from Australia via Bangkok to Yangon, before travelling to Prome to set sail on a 14 night luxury river cruise on 14th September 2017. Guests will sail the Irrawaddy and Chindwin Rivers to Schwegu, before culminating in Mandalay. This spectacular cruise allows guests to experience the enchanting wonders of Myanmar like never before. "This sensational cruise features the only itinerary in the 2017/2018 season that enables guests to travel along the Irrawaddy River and includes exploring ports along the Chindwin River. Travellers will uncover beautiful architecture, friendly locals and the authentic history and culture of this largely undiscovered part of the world. Guests will sail between Yangon and Mandalay stopping in ports along the Chindwin and Upper Irrawaddy Rivers." Highlights of this magical holiday experience include visits to: Kyaukhtatgyi Pagoda featuring one of the largest Buddhist statues in Myanmar; a number of temples in Bagan such as Shwezigon, Ananda, Dhammayangyi and Thatbyinnyu; the Shwebadaung caves; the colonial town of Katha, the setting for George Orwell's novel 'Burmese Days'; and Mandalay Hill with a summit 240m high. In addition travellers will sail through the grand walls of the Second Defile on the Irrawaddy. 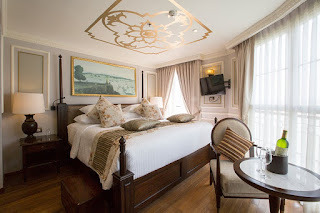 Cruiseco Explorer is designed to accommodate only 56 guests, which will allow travellers to enjoy an intimate, spacious and luxurious river cruise. The cabins feature polished timber floors and French windows or private balconies, so guests will be able to relax and enjoy the impeccable scenery along the Irrawaddy and Chindwin Rivers. "Accompanying guests on this magical holiday are specialist guides with a wealth of knowledge of this once forbidden land. Travellers will also be able to choose to enrich their holiday by adding on extension packages of three or four nights as part of our offerings" added Clarke. Prices, start from AUD$5,999* per person, based on twin share for Main Deck Cabin. This offer includes a saving of AUD$2,100* per person and is valid for a limited time only. Fares include: return economy airfares from Australia; luxury cruise aboard Cruiseco Explorer, including on board gratuities, soft drinks, local beers, wine, daily breakfast, lunch and dinner as specified in the itinerary; deluxe hotel accommodation, one night at the Mandalay Hill Resort in Mandalay, and two nights at the five-star Sule Shangri-La Hotel in Yangon; extensive sightseeing with expert local guides; and all transfers. To find out more or to make a booking, visit www.cruising.com.au or call (02) 9492 8520. *Prices are subject to availability and change. Terms and conditions apply.